The former leader of Dumfries and Galloway Council has resigned from the local Labour group over proposals to cut teacher numbers in the region. 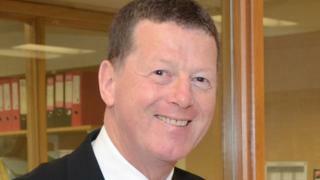 Ronnie Nicholson described plans to axe at least 40 teaching posts as "draconian". The local authority, which has a joint Labour and SNP administration, will meet on Thursday to set its budget. Labour group leader Elaine Murray said they had to make some "extremely hard choices" over a £16m funding gap. Image caption Councillors in Dumfries and Galloway are due to debate budget plans on Thursday. She also paid tribute to her predecessor, who led the council for more than three years, from October 2013. Mr Nicholson said he decided to step down over fears that cuts to teacher numbers would damage children's education. "This was an incredibly difficult decision for me to make but in all conscience I could not support a proposed SNP Labour budget which made such draconian cuts in teachers," he said. The councillor acknowledged that the administration faced an "impossible task" but he added: "The decision to axe at least 40 teaching posts is a cut too far and one that is avoidable. "The budget proposes over £500,000 of spending on new proposals such as a Community Initiative Fund and the council also propose to increase the reserves held. "I wanted to suggest that we used this money to retain teaching posts instead but I was prevented from even making this suggestion at the last Labour group meeting before the budget. "After decades as a Labour party member, I simply cannot be involved in a decision that will damage ours kids' education locally, therefore regrettably I had no choice but to resign from the Labour group". Ms Murray said Mr Nicholson's experience would be greatly missed but there would be no compulsory redundancies. She added: "Dumfries and Galloway Council has already been forced to make £96m of cuts since austerity began in 2010-11. "This year, we faced a further funding gap of over £16m, and the coalition administration has had to make some extremely hard choices in order to produce a fiscally competent budget, choices we have made with heavy hearts. "Any reduction in posts within the council will be made through early retirement and voluntary severance, redeployment and the elimination of vacancies. We will continue to adhere to our policy of no compulsory redundancies."